The aim of this study was to evaluate the usefulness of Phalaris arundinacea, Salix viminalis and Zea mays to the phytoremediation of the soil contaminated with nickel. A 2-year microplot experiment was carried out with plants growing on Ni-contaminated soil. Microplots (1 m2 × 1 m deep) were filled with Haplic Luvisols soil. Simulated soil contamination with Ni was introduced in the following doses: 0—no metals, Ni1—60, Ni2—100 and Ni3—240 mg kg−1. 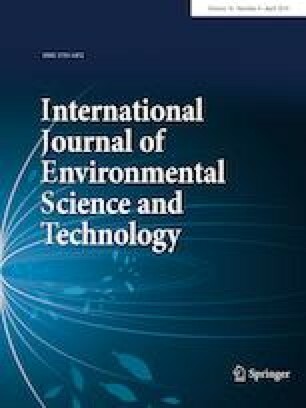 The phytoremediation potential of plants was evaluated using a tolerance index, bioaccumulation factor, and translocation factor. None of the tested plants was a species with high Ni phytoremediation potential. All of them demonstrated a total lack of usefulness for phytoextraction; however, they can be in some way useful for phytostabilization. Z. mays accumulated large amounts of Ni in the roots, which made it useful for phytostabilization, but, at the same time, showed little tolerance to this metal. For this reason, it can be successfully used only on soils medium-contaminated with Ni, where a large yield decrease did not occur. Its biomass may be safely used as cattle feed, as the Ni transfer from roots to shoots was strongly restricted. P. arundinacea and S. viminalis accumulated too little Ni in the roots to be considered as typical phytostabilization plants. However, they may be helpful for phytostabilization due to their high tolerance to Ni. These plants can grow in the soil contaminated with Ni, acting as a protection against soil erosion or the spread of contamination. Nickel, although necessary for living organisms in small amounts, is toxic to humans, animals, and plants after exceeding its tolerable level (Kabta-Pendias and Mukherjee 2007). This element gets into the environment from a number of anthropogenic sources, such as combustion of fossil fuels, mining and refining processes, nickel alloy manufacturing (steel), electroplating, incineration of municipal wastes and sewage sludge (Ahmad and Ashraf 2011; Gaj et al. 2007). Nickel contamination is highly probable to occur on the soils in the vicinity of metal smelters steel and mines. The total average Ni concentration in the soil is about 20 mg kg−1 (Kabat-Pendias and Mukherjee 2007), and the allowable maximum limit is generally set at the level of 100 mg kg−1 (Regulation of the Minister of the Environment 2016; Tóth et al. 2016). Soil contamination with Ni is not very common, but there are areas where human activity has led to its excessive accumulation. Literature data report of numerous places in the world where Ni exceeds the permissible limit. For example, the Ni concentration of the soil was 1600–2150 mg kg−1 at Sudbury smelting area in Canada (Adamo et al. 2002; Narendrula et al. 2012), 303 mg kg−1 at Plovdiv non-ferrous metal smelter in Bulgaria (Bacon and Dinev 2005), 267 mg kg−1 around the Selebi Phikwe Cu–Ni mine in Botswana (Ngole and Ekosse 2012), 212 mg kg−1 at the former sludge disposal site in Denmark (Algreen et al. 2014) and 122 mg kg−1 at the area of a former waste incineration plant in Czech Republic (Kacalkova et al. 2014). Ni-contaminated areas require remediation. One of the new, rapidly growing remediation methods, which uses plants, is phytoremediation. Its main advantage is positive effect on such soil parameters as fertility, biological activity and structure, as well as its lower cost compared to other remediation techniques (Ghosh and Singh 2005; Mulligan et al. 2001). The two most common phytoremediation techniques are phytoextraction and phytostabilization. Phytoextraction involves extracting contaminates from the soil by plants through incorporating them in their tissues and then removing them from the soil together with the harvested crops. Phytostabilization involves using plants to immobilize the contaminants in the soil. Metals are absorbed and accumulated by the roots, adsorbed on the roots, or precipitated in the rhizosphere (Karczewska et al. 2013; Stanislawska-Glubiak et al. 2012). This reduces the mobility of contaminants, making it difficult for them to migrate to groundwater and air, as well as lowers their bioavailability, thereby preventing their spread throughout the food chain. Plants used in phytostabilization reduce the amount of water percolating through the soil, thus minimizing the hazardous leaching and preventing soil erosion, and hence, stop the distribution of toxic metals to other areas (Srivastava 2016; Thakur et al. 2016). In the case of Ni, wind erosion poses the biggest threat. Ni is especially dangerous when it enters the body through dust inhalation (WHO 2000). Inhalation exposure to Ni causes toxic effects in the respiratory tract and immune system. Human and animal data provide strong evidence that inhalation exposure to some nickel compounds can induce lung cancer (Tokar et al. 2011). Ni toxicity to plants is manifested by the decrease in germination efficiency (Yusuf et al. 2011), the inhibition of growth and root branching (Seregin et al. 2003), the reduction of nutrient absorption by roots (Ahmad and Ashraf 2011), damage to the photosynthetic apparatus (Shafeeq et al. 2012), and the induction of oxidative stress (Ali et al. 2003). All these negative processes result in a significant decrease in yields. Plant sensitivity to high Ni concentration in soil can hinder the application of phytoremediation techniques, hence the search for the tolerant species suitable for Ni extraction or Ni stabilization is an issue of great practical importance. The usefulness of plants for metal phytoremediation is evaluated on the basis of several parameters such as: (1) the tolerance of the plants to the metal associated with producing sufficiently high yields, (2) metal bioaccumulation in the aboveground parts and roots measured by the bioaccumulation factor (BFabovegroundparts and BFroots) and (3) the transfer of metal from roots to the aboveground parts measured by the translocation factor (TF) (Raskin and Ensley 2000). BF (also called BAF or BCF) is defined as the ratio of metal concentration in aboveground parts or roots to the metal in the soil, whereas TF as the ratio of the metal in aboveground parts to the metal in roots (Golda and Korzeniowska 2016; Masarovicova et al. 2010; Melo et al. 2009; Stanislawska-Glubiak et al. 2015). Plants with a high biomass and high bioaccumulation factor for aboveground parts (BFaboveground parts > 1) are appropriate for phytoextraction (Cheraghi et al. 2011; McGrath and Zhao 2003), while plants with a high bioaccumulation factor for roots (BFroots > 1) and, simultaneously, with a low translocation factor (TF < 1) are appropriate for phytostabilization (Cheraghi et al. 2011; Roccotiello et al. 2010). The use of energy plants for the Ni phytoremediation may be a beneficial solution. The cultivation of these plants on contaminated lands can serve both for the remediation and for the production of biomass. Consequently, it is essential to identify the tolerance of the most used energy species such as willow, reed canary grass or maize to the excess of Ni in the soil and to investigate the Ni transfer from the roots to the aboveground organs, which is important from the point of view of plants suitability for phytoremediation. So far no studies have been done on the potential for reed canary grass in areas contaminated with Ni, despite the fact that this plant produces a lot of biomass and is often used as a source of energy. On the other hand, research on the potential of Ni phytoremediation of other species, mainly willow and maize, was mostly carried out in pots, or more often, in hydroponics, which does not reflect field conditions in which these plants actually grow (Antonkiewicz et al. 2016; Drzewiecka et al. 2012; Kopittke et al. 2010; Seregin et al. 2003). The only available study on willow and maize conducted under field conditions was on the soils contaminated with several metals jointly, which did not allow to draw conclusions about the Ni exclusively (Algreen et al. 2014; Kacalkova et al. 2014; Mleczek et al. 2009). All in all, there is a lack of research that could be a reliable basis for the assessment of the suitability of mentioned species for the phytoremediation of sites polluted with Ni. Therefore, our study, the objective of which is to assess the suitability of these species for Ni phytoremediation under conditions similar to the actual field, is a novelty. In this study, we hypothesized that three energy plants such as reed canary grass (Phalaris arundinacea), maize (Zea mays) and willow (Salix viminalis) can be useful for phytoextraction or phytostabilization of soils contaminated with nickel. This study was carried out during 2009–2010 in Institute of Soil Science and Plant Cultivation-State Research Institute in Pulawy Poland. The 2-year experiment was conducted at the Experimental Station Baborowko near Poznan (middle-west Poland) in four replicates with three tested plants: reed canary grass (Phalaris arundinacea), maize (Zea mays) and willow (Salix viminalis). In the year preceding the planting/seeding plants, concrete-framed microplots (1 m2 × 1 m deep without bottom) in the open air were filled with Haplic Luvisols soil—the most common type of soil in Poland. It was a coarse-textured soil with a low content of clay, low pH, and low content of organic matter (Table 1). The soil in microplots was artificially contaminated with Ni in the autumn in the year before the introduction of plants. During the winter microplots were exposed to precipitation. The following doses of nickel were applied: 0-the control (no metals), Ni1-40, Ni2-80 and Ni3-160 mg kg−1. In total, 48 microplots were used (3 plants × 4 treatments × 4 replicates). Nickel doses were established on the basis on the previous authors studies and literature data (Korzeniowska et al. 2007, Poulik 1997). Nickel in the form of sulfate was dissolved in water and applied to the microplots using a hand liquid spreader. To thoroughly mix the metal with the soil, it was first introduced into the 15–30 cm soil layer, mixed, and then into the 0–15 cm layer, where it was carefully mixed again. The plants were planted or sown in the spring, 1 year after the introduction of Ni into the soil. All the test plants, apart from P. arundinacea, were initially planted in higher density, and after 2 months, plant thinning was performed, leaving 5 plants of S. viminalis and 12 of Z. mays on the microplot. In the case of P. arundinacea, 6 g of seeds was sown per plot. In two growing seasons of the study, basic NPK fertilization was applied in the spring at 10: 2: 8 g per plot, respectively. The plants on microplots were hand-weeded and watered during the periods of insufficient rainfall. The biomass of the aboveground parts and roots of Z. mays and S. viminalis were determined by collecting the plants from the area of 1 m2. Root biomass of S. viminalis was determined only for the second growing season. There was no possibility of determining root biomass in the first season due to the fact that S. viminalis is a perennial plant. Z. mays was collected on September 6, 2009, and September 3, 2010 (stems with leaves and cobs), while S. viminalis on October 25, 2009, and October 6, 2010 (branches with leaves), respectively, in the first and second growing season. The biomass of the aboveground parts of P. arundinacea in the first growing season was determined on the basis of 1 m2, while root biomass—on the basis of two rows of plants—removed from a plot (0.2 m2). In the second season, the biomass of the aboveground parts and roots was evaluated based on the plants remaining per plot (0.8 m2). P. arundinacea was harvested at the heading stage, giving only 1 biomass cut in the first growing season (September 25, 2009) and 3 cuts in the second season ( July 23/ August 8/ August 23, 2010). The samples of the plants for chemical analyses were collected during the harvest: Z. mays—(1) stems with leaves, (2) ears, (3) roots, P. arundinacea—(1) shoots, (2) roots, S. viminalis—(1) twigs, (2) leaves, (3) roots. All plant samples were carefully washed, dried at 60 ◦C, and finely ground. Soil samples were collected during each autumn after the harvest using an Eijkelkamp soil sampler of the diameter size 2.5 cm. The sample from each microplot consisted of carefully mixed five subsamples, taken randomly across the plot from depth 0–30 cm. Air-dry samples were passed through a sieve with the mesh size of 2 mm. Tolerance of Z. mays, P. arundinacea and S. viminalis to the excess of Ni was compared using tolerance index (TI), which reflected resistance to contamination. To compare the accumulation and distribution of Ni in the tested plants, three parameters were used: bioaccumulation factor for aboveground parts and roots (BF) and translocation factor (TF). Net photosynthesis rate was measured in the first growing season, at the beginning of July (9 July and 10 July) using a portable Li 6400 recorder (LI-COR). The measurements were taken under comparable ambient conditions: in the morning (9.00–12.00 am) at the constant PAR radiation 1200 μmol m−2 s−1, CO2 concentration 390 mg kg−1, and temperature 23–26 °C. Net photosynthesis was measured on randomly selected, youngest fully formed leaves in 12 replicates (3 measurements for each replicate). All chemical analyses were done by the Central Laboratory of the Institute of Soil Science and Plant Cultivation-State Research Institute, certified by the Polish Centre of Accreditation according to PN-EN ISO/IEC 175 17025 (certificate no. AB 339). P and K in soil were determined by Egner–Riehm method (PN-R-04023:1996 and PN-R-04022:1996 adequately), Mg by Schachtschabel method (PN-R-04020:1994), total organic carbon (TOC) by Tiurin method using potassium dichromate (ISO 14235:2003), pH—potentiometrically in 1 mol KCl.dm−3 (ISO 10390:2005), and texture by the aerometric method (PN-R-04033:1998). The Ni concentration in the soil was determined using aqua regia (ISO 11466:1995). After the digestion, Ni was determined using the FAAS method. Nickel in plant tissue was determined by the FAAS method, having first dry ashed the material in a muffle furnace and digested it with 20% nitric acid (PN-R-04014:1991). A standard reference material IPE 952 (International Plant-Analytical Exchange) from Wageningen (Netherlands) was used for quality control purposes. The recovery values ranged from 88 to 106%, which were considered satisfactory. The results of plant biomass and Ni concentration were given as the means from four replications, and for net photosynthesis as a mean from 12 replications. ANOVA calculations were performed using the Statgraphics v 5.0 software. Multiple comparisons among groups were made with Tukey’s honestly significant difference (P < 0.05). Ni concentration in the soil after plant harvest remained at a similar level in both growing seasons (Table 2). The concentration of Ni in soil at the end of both growing seasons was slightly higher than doped probably due to the doping process and soil homogenization; however, differences in relation to the expected values were low. The average concentration of this metal in Ni1 ranged from 49.9 to 58.2 mg kg−1, in Ni2—from 89.5 to 111 mg kg−1, while in Ni3 treatment—from 182 to 186 mg kg−1, depending on the plant species. These concentrations corresponded to, respectively, weak, medium and heavy contamination level according to the limits of soil contamination with heavy metals by Kabata-Pendias et al. (1993). This assessment takes into account soil features such as soil fraction < 0.02 mm and soil pH (Table 3). According to the Polish standards (Regulation of the Minister of the Environment 2016), the total Ni concentration in the soil on agricultural areas should not exceed 100 mg kg−1, which coincides with the upper limit of the average soil contamination acc. to Kabata-Pendias et al. (1993). In the present study, the Ni concentration exceeded the allowable limit only in the treatment Ni3. Nickel contamination assessment of light sandy soil according. Ni phytotoxicity, manifested by the reduction in biomass yields, varied depending on the plant species and the level of soil contamination Ni1–Ni3 (Table 4). Plants responded to the Ni reduction of both the biomass of the aboveground parts and roots. The biomass of the aboveground parts of each tested species systematically decreased relative to the control, together with increasing Ni in the soil. It was noticed in both growing seasons (Table 4, Fig. 1). However, the differences between the seasons in plant responses to Ni should be considered differently for an annual plant Z. mays than for perennials, P. arundinacea and S. viminalis. The biggest reduction in the aboveground parts was recorded for Z. mays. The biomass of this plant in the first growing season decreased significantly, by 19% in N2, and by 71% in N3. It was similar in the second season, where the reduction was 13 and 83%, respectively. 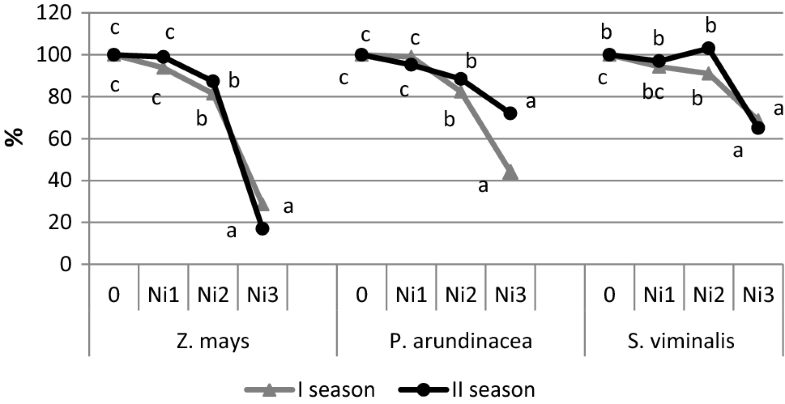 The biomass of the aboveground parts of the perennial grass P. arundinacea decreased only in Ni3, whereas in the second growing season, this reduction was significantly smaller (28%) in comparison with the first season (56%). The authors believe that this may be related to the age and length of roots. It can be assumed that in the second season, the roots of grass reached the deeper, into the uncontaminated soil layers. Microplots used in our experiment were 1 m deep, while Ni was introduced to a depth of 30 cm only. Korzeniowska and Stanisławska-Glubiak (2015) recorded a similar phenomenon in another grass (Spartina pectinata); there was a smaller yield decline under the influence of Ni in the second year than in the first year of growth. S. viminalis exhibited a much lower sensitivity to high concentrations of Ni in the soil than P. arundinacea and Z. mays. A significant reduction in the aboveground parts in Ni3 treatment for S. viminalis did not exceed 35% in both growing seasons, while for other two plants was much higher, especially in the first season. Soil contamination with Ni resulted not only in the reduction in the aboveground parts, but also the reduction in the growth of roots, with the exception of S. viminalis (Table 4, Fig. 2). Particularly large reductions were recorded for Z. mays. In the first growing season, the root biomass of this plant decreased significantly by 21% in N2 and by 77% in N3 treatment, while in the second season, by 64% in N3 in relation to the control. The impact of Ni on the restriction of the growth of the Z. mays roots was confirmed by other authors who, under hydroponic conditions, found that Ni accumulated in the roots restricted their branching (Seregin et al. 2003) and a length (Maksimovic et al. 2007). In the species P. arundinacea, soil contamination with Ni caused a reduction in the biomass of roots only at the level of Ni3. In both seasons, growth reduction was, respectively, 38 and 28% compared to the control. It should be noted that in this perennial grass, in the first season, the reduction in biomass yields caused by an excessive Ni in the soil, was bigger for the aboveground parts (the decrease by 58%) than for the roots (38%), while in the second season, it was similar for the two parts (28% each). Tolerance indices, calculated for both aboveground parts and roots of the tested plants, indicate that Z. mays is the most sensitive species to excessive Ni in the soil, while S. viminalis is the most tolerant one (Table 5). There are no studies in field condition that would confirm our results of high tolerance of S. vinimalis and low tolerance of Z. mays for Ni. The field studies with S. viminalis were conducted by Ali et al. (2003), Algreen et al. (2014), and Kacalkova et al. (2014), but only on soils contaminated with several heavy metals jointly, so it was not possible to assess the impact of the Ni exclusively on the formation of willow biomass. It is possible to find some information about tolerance of S. viminalis and Z. mays to Ni exclusively, but obtained on the basis of pot or hydroponic experiments. Torres et al. (2016), in the pot experiment, observed a 40% biomass reduction in 50-day shoots of Z. mays at a dose of 10 mg dm−3 Ni. A significant tolerance of S. viminalis to Ni in hydroponic conditions was demonstrated by Drzewiecka et al. (2012). According to these authors, this plant can be grown on soils heavily contaminated with Ni. It should be noted, however, that the bioavailability of metals from nutrient solutions or pots is much higher than that of field soils, and such studies cannot be used to assess the actual suitability of plants for phytoremediation. However, hydroponic and pot studies allow to compare the tolerance of several species between themselves to Ni. A high sensitivity of Z. mays to Ni found in our studies has been confirmed by Antonkiewicz et al. (2016). These authors found that the hydroponically grown Z. mays responded with a bigger reduction of the aboveground parts to the increase in Ni concentration in the culture medium (80% compared to control) than beans (60%) or lettuce (23%). Nickel decreased the net photosynthesis rate of all the tested plant species (Table 6). A significant decrease occurred with Z. mays in Ni2 and Ni3 and with P. arundinacea and S. viminalis in N3 treatment. These results are consistent with the above-mentioned biomass decrease in the aboveground parts of the tested species. The inhibition of photosynthesis rate was the biggest with Z. mays, while the smallest with S. viminalis. Physiological studies confirm that Ni damages the photosynthetic apparatus at almost every level of its organization (Chen et al. 2009). Shafeeq et al. (2012), in pot experiments, recorded a systematic decrease photosynthetic rate of wheat together with an increasing dose of Ni from 50 to 300 mg kg−1. Ni concentration in organs of Z. mays was in the following order: ears < steams < roots (Table 7). Ears contained 1.7–5.4 mg kg−1, while stems 1.1–10.7 mg kg−1 Ni, depending on the level of contamination of the soil and the growing season. These concentrations do not exceed the maximal tolerable dietary level of this metal for beef cattle and dairy cattle, which is 50 mg kg−1 dm. (NRC 1996; NCR 2001). The roots contained a dozen or even several dozen times more Ni than the aerial parts. At the highest level of contamination of Ni3, the roots contained, respectively, 16 and 12 times more Ni than the stems, and 44 and 24 times more Ni than the ears, respectively, for the first and second season. Ni concentration in the aboveground parts of P. arundinacea was higher than in Z. mays, amounting to 10.1–31.6 mg kg−1, depending on the level of contamination and a season, but it never exceeded the maximal tolerable dietary level. In their roots, the plants accumulated only a few times more Ni than in aboveground parts. The roots contained about 4–5 times more Ni than the aboveground parts, regardless of the level of contamination of Ni1–Ni3 or the growing season. Ni concentration in the organs of S. viminalis was in the following order: twigs < leaves < roots. Twigs contained 2.1–6.2 mg kg−1, while leaves 3.5–10.4 mg kg−1 Ni, depending on the level of Ni and a season. The roots had a several times higher Ni concentration than the leaves or twigs. At the level of Ni3, it was 7.5 and 2.5 times higher than in leaves, and 7.5 and 6.5 times higher compared to the twigs, depending on the growing season. In our study, Z. mays showed the highest ability to accumulate Ni in the roots among the plants tested. These results are confirmed by Antonkiewicz et al. (2016), who found that hydroponically growing Z. mays accumulated 30 times more Ni in the roots than in the stems at the concentration of 10 mg dcm−3 Ni in nutrient solution. There is a lack of reports on the response of P. arundinacea to Ni. Only Vymazal et al. (2011) found a higher Ni concentration in the roots than in the aboveground parts of the grass growing in a constructed wetland treated with municipal sewage. Other authors also observed a higher Ni concentration in the roots in comparison with the aboveground parts of other plant species (Ahmad et al. 2007; Al Chami et al. 2015; Antonkiewicz et al. 2016). Similarly as in our research on S. viminalis, Drzewiecka et al. (2012), under hydroponic conditions, observed the smallest Ni concentration in the twigs, higher in leaves, while the highest in the roots. In the study of Kacalkova et al. (2014), willow growing on soils naturally contaminated with several metals jointly, accumulated more Ni in the leaves than in the twigs. Moreover, willow leaves contained more Ni compared with the leaves of maize, sunflower, or poplar. A significant accumulation of Ni in the leaves of S. viminalis was also emphasized by Mleczek et al. (2009), even though the concentration of this metal in the roots was higher. The tested plants showed a various ability to accumulate Ni, as measured by bioaccumulation factor (BF) (Table 8). S. viminalis accumulated small amounts of Ni, both in the aboveground parts and in the roots (mean BFtwigs and BFleaves ≤ 0.09, BFroots ≤ 0.19). Among the tested plants, P. arundinacea showed the highest ability to bioaccumulate Ni by the aboveground parts and relatively high by roots (mean BFshoots = 0.17–0.18, BFroots = 0.67–0.81). Z. mays accumulated the least Ni in the aboveground parts, and at the same time, the most Ni in the roots (mean BFsteams and BFears ≤ 0.06, BFroots = 0.7–1.0). Other authors confirm the low bioaccumulation of Ni by the aboveground parts of maize. Fargasova (2012) and Antonkiewicz et al. (2016) showed a lower BF value for Z. mays than for Vicia sativa, Raphanus sativus, Synapsis alba, lettuce and field bean. In our study, all the plants accumulated more Ni in the roots than in the aboveground parts (BFroots > BFaboveground parts). At the same time, all BFaboveground parts were much lower than 1.0, indicating a total lack of usefulness of the tested plants for phytoextraction (McGrath and Zhao 2003). At the same time, the value of BFroots close to 1.0 for Z. mays suggests its suitability for phytostabilization (Cheraghi et al. 2011). Ni transport from the roots to the aboveground parts of all three species tested was limited, as evidenced by the values of TFs < 1 (Table 9). However, TFs values for Z. mays were significantly lower than for P. arundinacea and S. viminalis, oscillating from 0.02 to 0.08. It means that plants transferred only 2–8% Ni from the roots to the aboveground parts. Also, in the studies of Fargasova (2012) and Antonkiewicz et al. (2016), the values of TFs for Z. mays were lower than for other species investigated plants. According to Seregin et al. (2003), Z. mays belongs to excluder plants, as its roots constitute a barrier limiting Ni transport to the shoots. P. arundinacea and S. viminalis showed higher TF values than Z. mays. The mean TFshoots for P. arundinacea were 0.20–0.28, while TFtwigs and TFleaves for S. viminalis were 0.18–0.20 and 0.34–0.52, respectively, depending on the growing season. The efficiency of phytoremediation depends on the tolerance of plant species to contamination and their ability to accumulate metals in aboveground organs and roots. Metal phytoextraction from the soil can be performed by tolerant plants with high biomass production and BFaboveground part > 1, while phytostabilization by plants without a significant biomass reduction and having BFroots > 1 and TF < 1. None of the tested plants was a species with high Ni phytoremediation potential, as they did not meet the necessary above-mentioned criteria. Z. mays showed a relatively high ability to bioaccumulate Ni in the roots (BFroots ~ 1), and at the same time, a unique ability to prevent its transfer to the aboveground parts (TF ≤ 0.08). Due to this mechanism, Ni concentration in the tissues of the aboveground parts does not exceed the maximal tolerable dietary level for cattle, even under heavy soil contamination. These traits may indicate a high phytostabilization potential of Z. mays. Unfortunately, on the heavily contaminated soils, this plant showed the lowest tolerance to Ni among the three species, which was reflected by a significant, up to 83%, biomass reduction. However, Z. mays can be successfully used for phytostabilization of the soils medium-contaminated with Ni, while biomass collected annually can be safely used as feed for cattle. 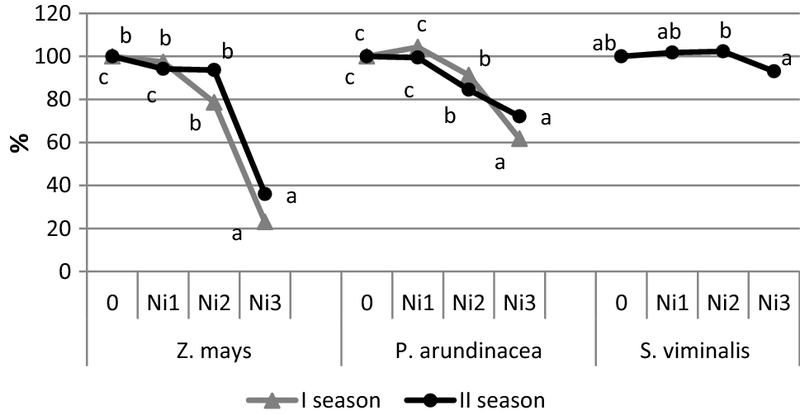 Perennial P. arundinacea and S. viminalis showed a higher Ni tolerance than Z. mays, whereas this tolerance increased in the second growing season compared to the first one, especially for P. arundinacea. However, both species accumulated too little Ni in the aboveground parts (BFaboveground parts < 1) to be suitable for phytoextraction. In addition, both plants showed a low Ni transfer from the roots to the aboveground parts (TF < 1), but due to its very low bioaccumulation in the roots (BFroots < 1), they did not meet all the conditions necessary for phytostabilization. However, it seems that the species may be helpful for phytostabilization due to their high tolerance to Ni. This metal does not significantly reduce the mass of their roots or the aboveground parts; hence these plants can grow and develop in the soil contaminated with Ni, at the same time acting as a protection against soil erosion or the spread of contamination. Based on the research, we may assume that Z. mays and S. viminalis use a different mechanism of Ni tolerance. Z. mays is a typical excluder that accumulates Ni in the roots without transferring it to the aboveground parts, thereby protecting the photosynthetic apparatus. S. viminalis uses a different strategy. It accumulates very little Ni in the roots, somehow defending itself against Ni uptake it from the soil. Clarifying the mechanism that allows S. viminalis to avoid Ni collection from the soil requires further research. The work has been supported by the Polish Ministry of Agriculture and Rural Development under 3.4.2. 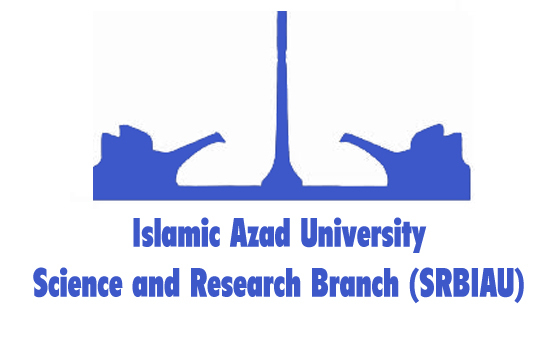 Scientific Research Program of Institute of Soil Science and Plant Cultivation in Pulawy.